“The potential for Jakarta to be submerged isn’t a laughing matter,” says Heri Andreas, who has studied Jakarta’s land subsidence for the past 20 years at the Bandung Institute of Technology. 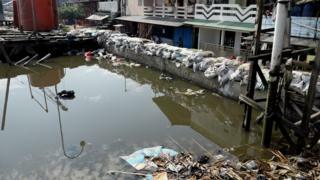 It’s already happening – North Jakarta has sunk 2.5m in 10 years and is continuing to sink by as much as 25cm a year in some parts, which is more than double the global average for coastal megacities. 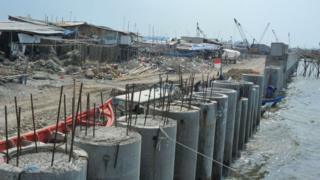 Jakarta is sinking by an average of 1-15cm a year and almost half the city now sits below sea level. The impact is immediately apparent in North Jakarta. 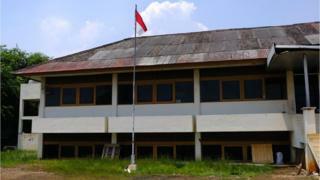 In the district of Muara Baru, an entire office building lies abandoned. It once housed a fishing company but the first-floor veranda is the only functional part left. 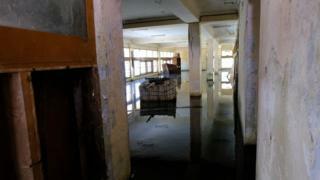 The submerged ground floor is full of stagnant floodwater. 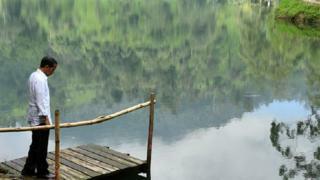 The land around it is higher so the water has nowhere to go. Buildings that are so deeply sunk are rarely abandoned like this, because most of the time the owners will try to fix, rebuild and find short-term remedies for the issue. But what they can’t do is stop the soil sucking this part of the city down. An open air fish market is just a five-minute drive away. “The walkways are like waves, curving up and down, people can trip and fall,” says Ridwan, a Muara Baru resident who often visits the fish market. As the water levels underground are being depleted, the very ground market-goers walk on is sinking and shifting, creating an uneven and unstable surface. “Year after year, the ground has just kept sinking,” he said, just one of many inhabitants of this quarter alarmed at what is happening to the neighbourhood. 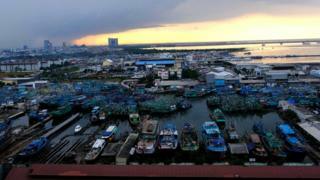 North Jakarta has historically been a port city and even today it houses one of Indonesia’s busiest sea ports, Tanjung Priok. Its strategic location where the Ciliwung river flows into the Java Sea was one of the reasons why Dutch colonists chose to make it their bustling hub in the 17th Century. Today 1.8 million people live in the municipality, a curious mixture of fading port businesses, poor coastal communities and a substantial population of wealthy Chinese Indonesians. Click play to see the changes. Jakarta’s land subsidence on 1977. Jakarta’s land subsidence on 1997. Jakarta’s land subsidence on 2007. Jakarta’s land subsidence on 2017. Jakarta’s land subsidence on 2025. Jakarta’s land subsidence on 2050. Source: Dr. Heri Andreas, Faculty of Earth Sciences and Technology, Bandung Institute of Technology.Note: 2025 and 2050 predictions are based on research by Dr. Heri Andreas. Fortuna Sophia lives in a luxurious villa with a sea view. The sinking of her home is not immediately visible but she says cracks appear in the walls and pillars every six months. But the impact on the small homes right by the sea is magnified. Residents who once had a sea view now see only a dull grey dyke, built and rebuilt in a valiant attempt to keep seawater out. “Every year the tide gets about 5cm higher,” Mahardi, a fisherman, said. None of this has deterred the property developers. More and more luxury apartments dot the North Jakarta skyline regardless of the risks. The head of the advisory council for Indonesia’s Association of Housing Development, Eddy Ganefo, says he has urged the government to halt further development here. But, he says, “so long as we can sell apartments, development will continue”. The rest of Jakarta is also sinking, albeit at a slower rate. In West Jakarta, the ground is sinking by as much as 15cm annually, by 10cm annually in the east, 2cm in Central Jakarta and just 1cm in South Jakarta. 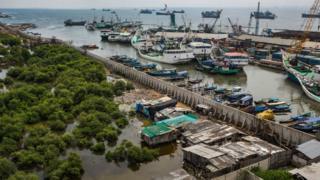 Coastal cities across the world are affected because of rising sea levels caused by climate change. Increased sea levels occur because of thermal expansion – the water expanding because of extra heat – and the melting of polar ice. 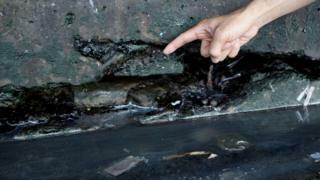 The speed at which Jakarta is sinking is alarming experts. It may seem surprising but there are few complaints from Jakartans because for residents here the subsidence is just one among a myriad of infrastructure challenges they have to deal with daily. And that is part of the story of why this is happening. The dramatic rate at which Jakarta is sinking is partly down to the excessive extraction of groundwater for use as drinking water, for bathing and other everyday purposes by city dwellers. Piped water isn’t reliable or available in most areas so people have no choice but to resort to pumping water from the aquifers deep underground. But when groundwater is pumped out, the land above it sinks as if it is sitting on a deflating balloon – and this leads to land subsidence. 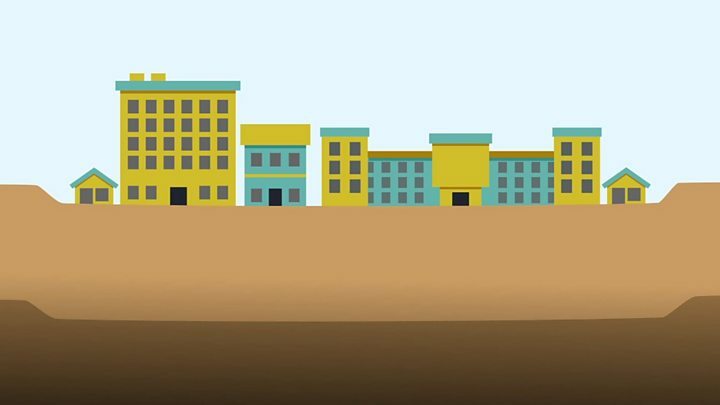 The situation is exacerbated by lax regulation allowing just about anyone, from individual homeowners to massive shopping mall operators, to carry out their own groundwater extractions. “Everyone has a right, from residents to industries, to use groundwater so long as this is regulated,” says Heri Andreas. The problem is that they take more than what is allowed. People say they have no choice when the authorities are unable to meet their water needs and experts confirm that water management authorities can only meet 40% of Jakarta’s demand for water. A landlord in central Jakarta, known only as Hendri, runs a dormitory-like block called a kos-kosan and has been pumping his own groundwater for 10 years to supply tenants. He is one of many on his street who do this. The local government has only recently admitted it has a problem with illegal groundwater extraction. In May, the Jakarta city authority inspected 80 buildings in Central Jakarta’s Jalan Thamrin, a road lined with skyscrapers, shopping malls and hotels. It found that 56 buildings had their own groundwater pump and 33 were extracting water illegally. Jakarta’s Governor Anies Baswedan says everyone should have a licence, which will enable the authorities to measure how much groundwater is being extracted. Those without a licence will have their building-worthiness certificate revoked, as would other businesses in the same building. Authorities are also hoping that the Great Garuda, a 32km outer sea wall being built across Jakarta Bay along with 17 artificial islands, will help rescue the sinking city – at a cost of about $40bn. It’s being supported by the Dutch and South Korean governments and creates an artificial lagoon in which water levels can be lowered to allow the city’s rivers to drain. It will help with the flooding which is an issue when the rains come. But three Dutch non-profit groups released a report in 2017 which cast doubt on whether the sea wall and artificial islands could solve Jakarta’s subsidence problem. Jan Jaap Brinkman, a hydrologist with the Dutch water research institute Deltares, argues it can only ever be an interim measure. 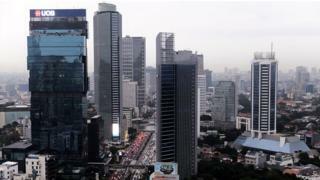 He says it will only buy Jakarta an extra 20-30 years to stop the long-term subsidence. “There is only one solution and everybody knows the solution,” he says. That would be to halt all groundwater extraction and solely rely on other sources of water, such as rain or river water or piped water from man-made reservoirs. 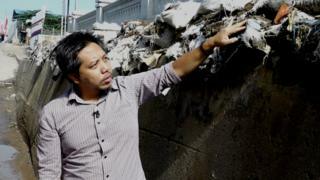 He says Jakarta must do this by 2050 to avoid major subsidence. It is not a message that is being taken to heart yet and Jakarta’s Governor Anies Baswedan thinks a less drastic measure will do. He says people should be able to extract groundwater legally as long as they replace it using something called the biopori method. This involves digging a hole, 10cm in diameter and 100cm deep, into the ground to allow water to be reabsorbed into the soil. Critics say this scheme would only replace water at a superficial level, whereas in Jakarta water is often pumped out from several hundred metres below ground level. There is technology to replace groundwater deep at its source but it’s extremely expensive. Tokyo used this method, known as artificial recharge, when it faced severe land subsidence 50 years ago. 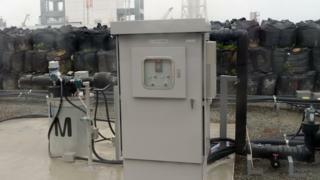 The government also restricted groundwater extraction and businesses were required to use reclaimed water. Land subsidence subsequently halted. But Jakarta needs alternative water sources for that to work. Heri Andreas, from Bandung Institute of Technology, says it could take up to 10 years to clean up the rivers, dams and lakes to allow water to be piped anywhere or used as a replacement for the aquifers deep underground. 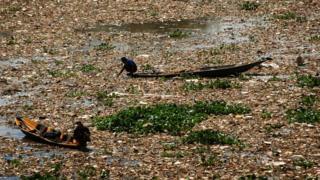 Jakarta’s residents adopt a somewhat fatalistic attitude to their future in this sinking city. Additional reporting by Tom de Souza. Interactive elements Arvin Surpriyadi, Davies Surya, and Leben Asa.